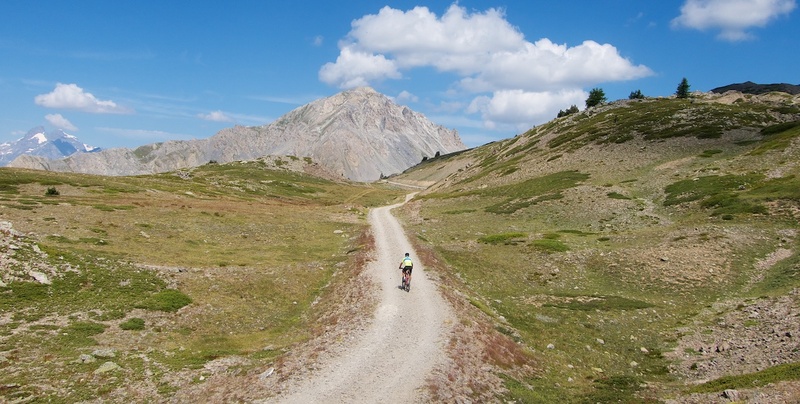 For the 20 highest paved roads in France see here. 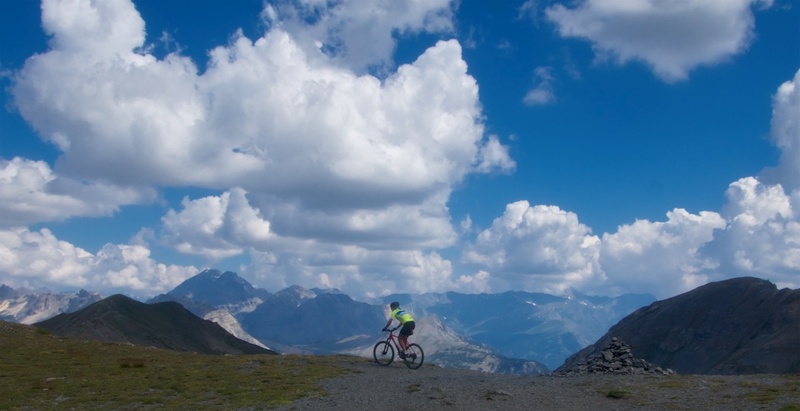 It was Col du Granon bike day so the road was closed to cars from 8am – 11am. 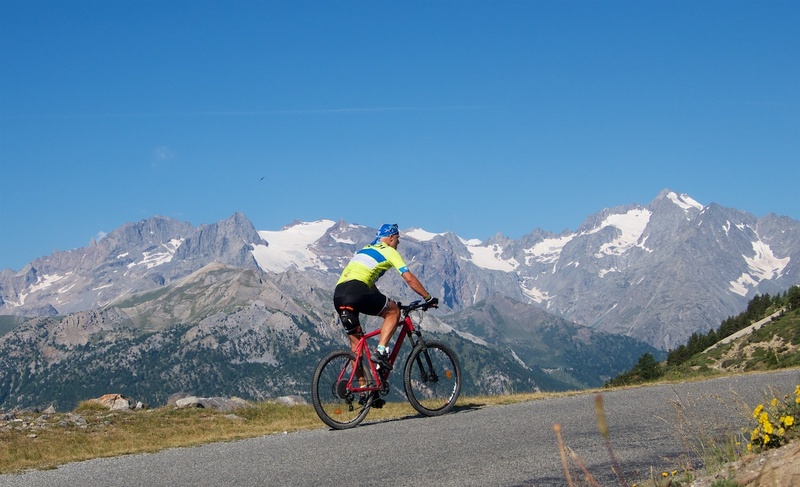 Col du Granon (2413 metres) is a beast of a climb, with constant views of glaciers atop the peaks of the Massif des Écrins. Preparing for this ride I had mapped out various potential detours to various cols and forts planning to decide visually how rideable each option looked. Ultimately, ever single idea worked perfectly. I’ve labeled all the locations on the map at the very bottom. I’ll go through them one by one. My first detour was a couple of kilometres before Col du Granon. 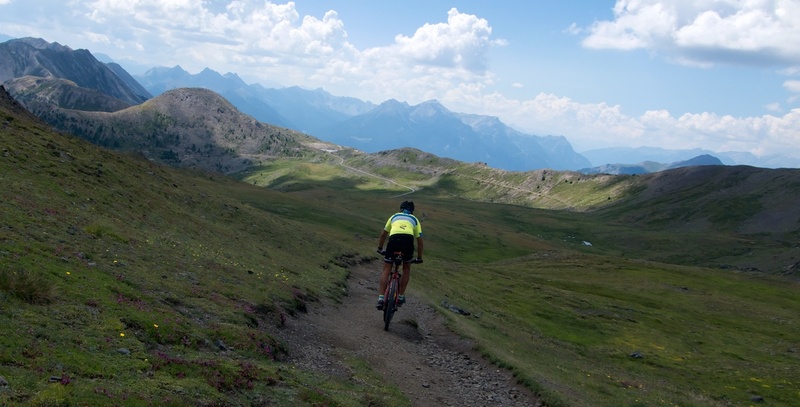 It’s a roughly five kilometre ride around a ridge to Col de Buffère. It’s a lousy surface but a road the entire way. The road ends at the col but there are definitely rideable trails the far side. 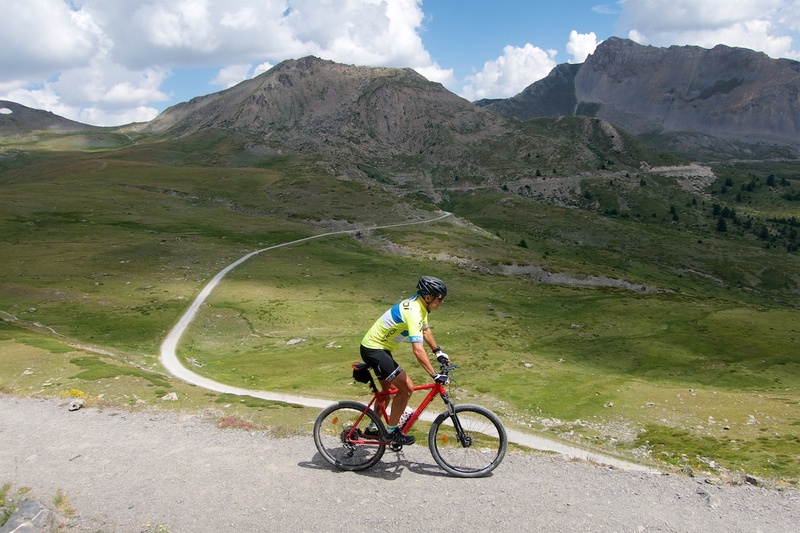 But it would take me away from my other goals so I simply doubled back and finished the climb to Col du Granon. But it’s a beautiful detour. 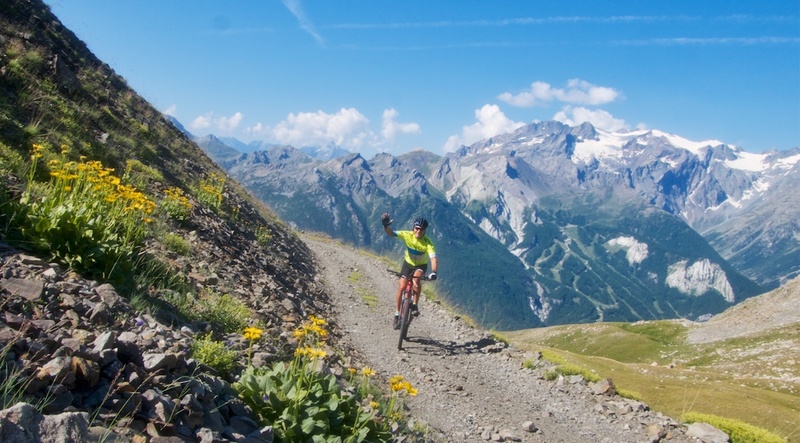 At Granon, there were free drinks and food and the typically friendly environment of these bike-only days. 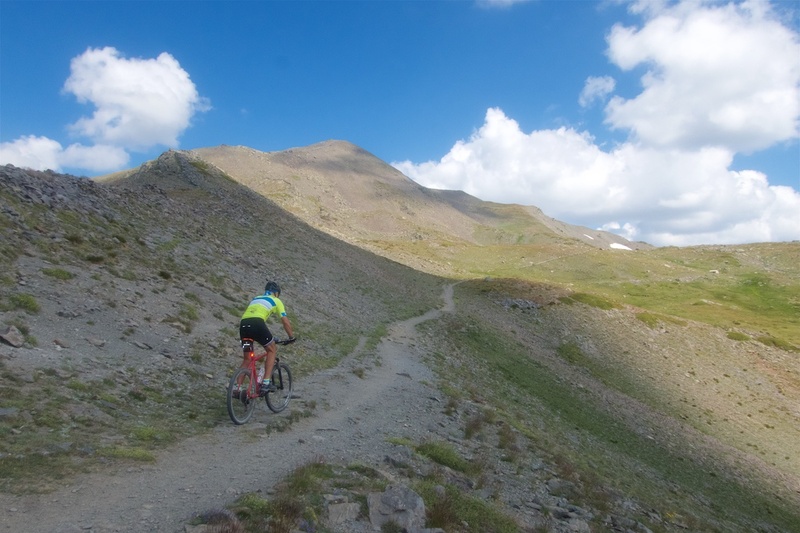 But while everyone else planned their descent, I took another gravel road that begins exactly at the col. The gravel road goes all the way to Porte de Cristol but ends there. Again, it defintely looked possible to take the trails on the far side into another valley. But I doubled back to find a couple more cols nearby. It was just a short climb up to Col des Cibières and the end of another road. 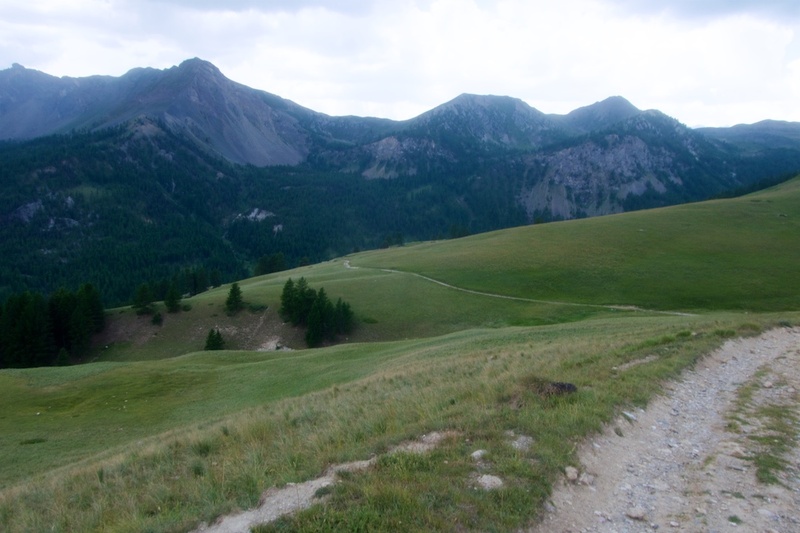 But this time I jumped on the trail and traversed to Col de l’Oule. I could see a nice lake down the far side, but it was a steep hiking trail. 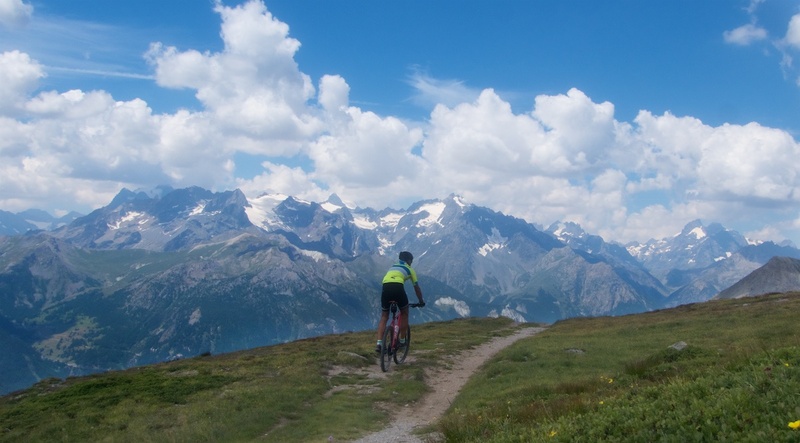 So I descended a wide open plain back to Col du Granon. 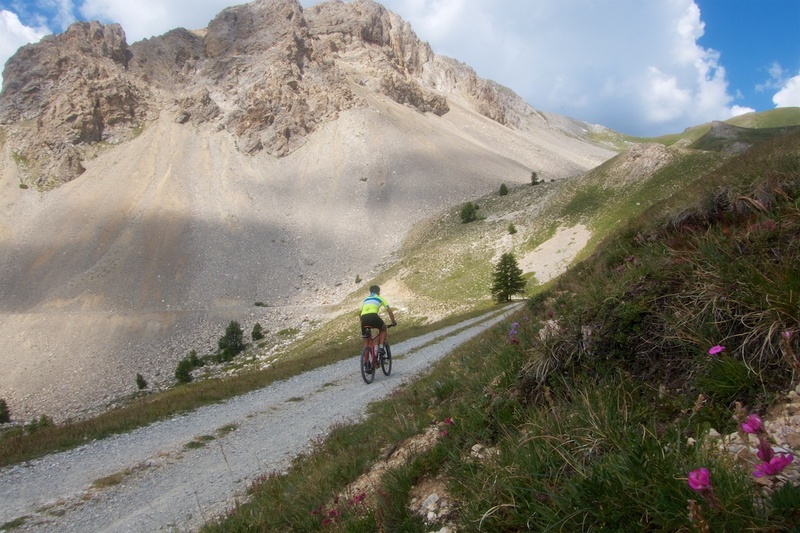 Back at Granon, I descended briefly on the main road and took yet another gravel road to Col de Barteaux. Great views at the col. The far side of Barteaux looked far less likely for a bike-ride than all the other options I’d seen. From Barteaux I took a hiking trail back to Col du Granon. 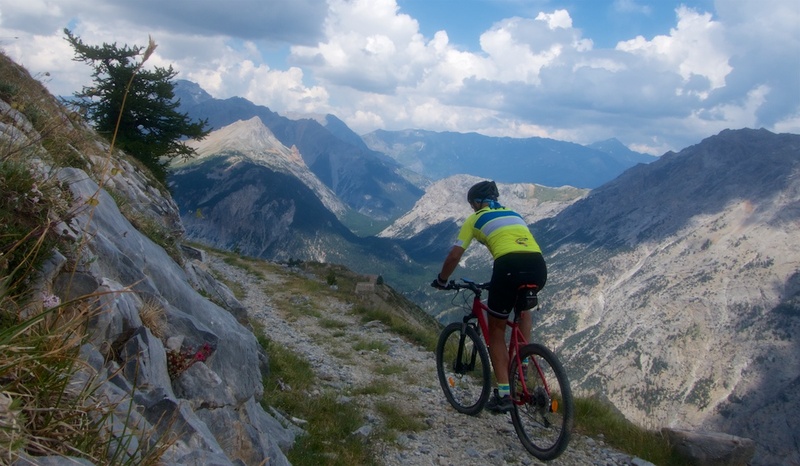 I was quite pleased at reaching five unpaved Cols. The day was going well. But amazingly, the best was yet to come. Now I took the main military road that exits the back side of Granon. This is a better quality road than my other detours, but cars are forbidden. It’s initially a few easy, beautiful, strategic kilometres heading towards the Italian border. After 5 kilometres I reached an intersection with a choice of higher or down. 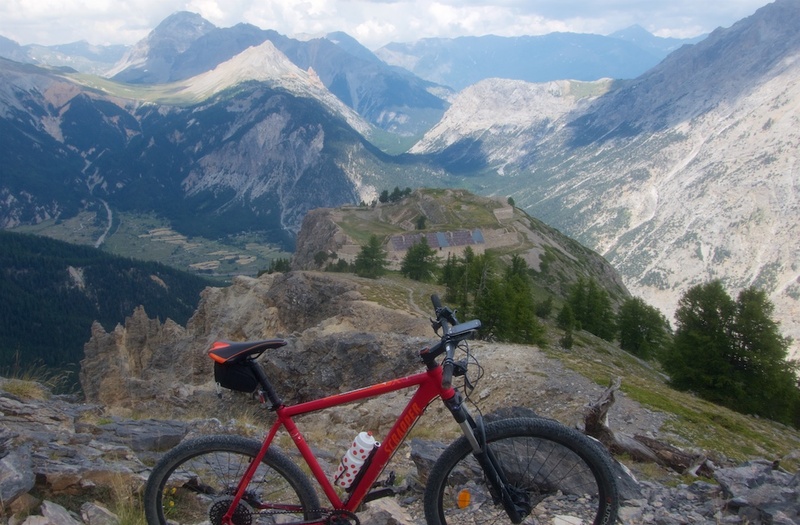 I chose higher and struggled up some rough hairpins to the “ancien” Fort de Lenlon (2508 metres). Next, I would take a very old military road with long sections in absolutely terrible condition (big rocks everywhere) down to Fort d’Olive (2239 metres). It’s fun descending, but I wouldn’t suggest climbing from the other direction. 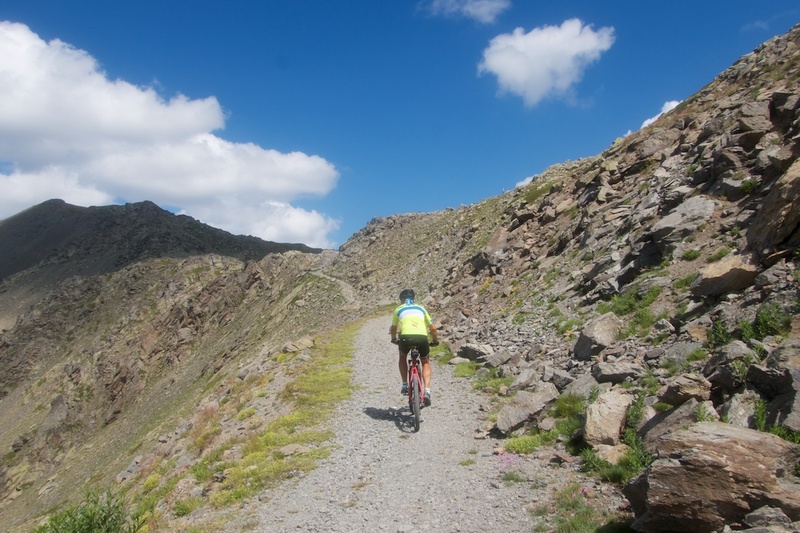 This back descent of Granon is unpaved until near the main road well below. It’s full of hairpins and a decent surface. It would be a great climb. 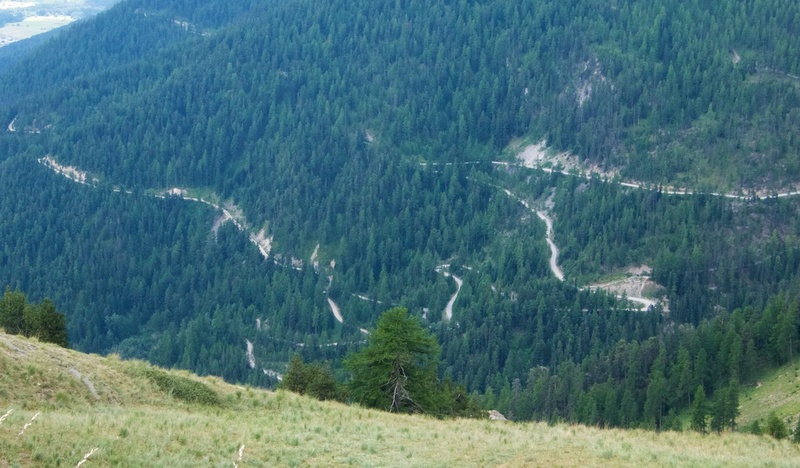 Because of the weather, I only took one more photo, a view of some of the hairpins well below. This was one of the greatest little adventures I’ve done on a bike. 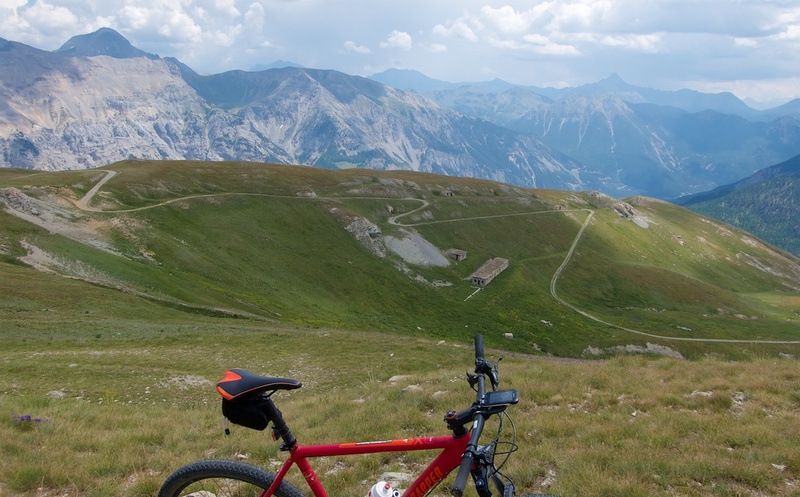 I had climbed Granon once a decade ago, but because I was using a road bike, I missed endless extra fun. This was the second ride of a three day loop. 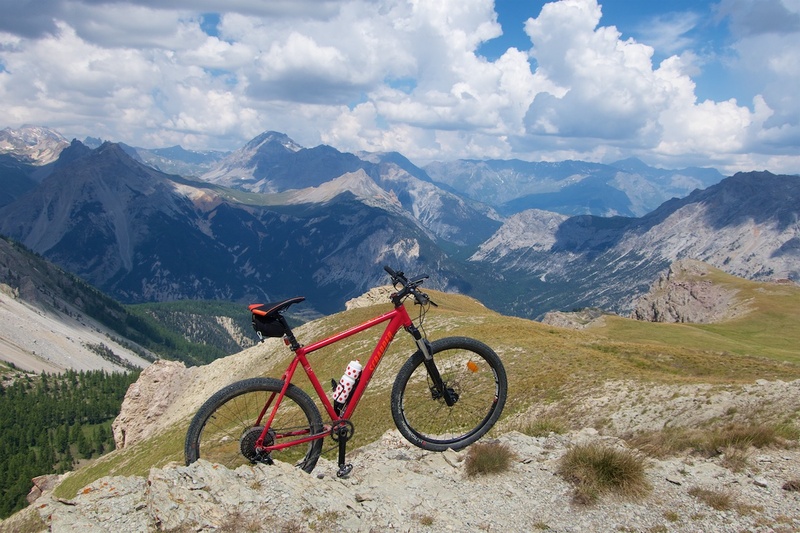 It includes something like 14 cols well above 2000 metres and most reachable only with thicker tires. This is a map of the entire route. Fantastic and inspiring information. 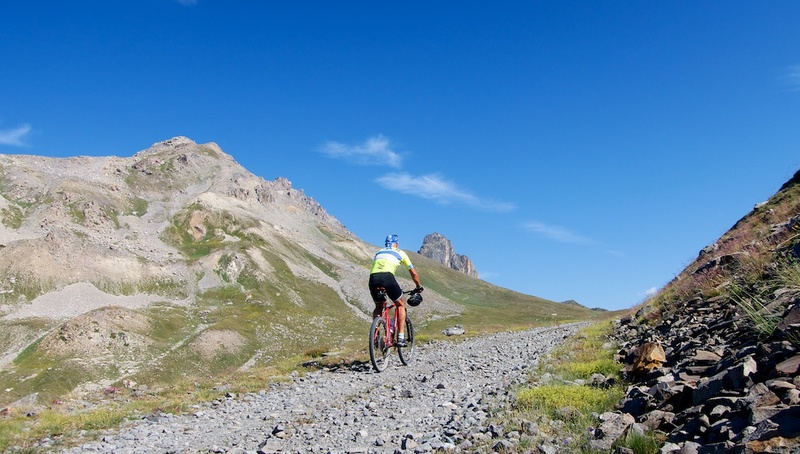 Leave the vanity ( and road bike ) at home!